Every STEINWAY & SONS grand and upright is a masterpiece of craftsmanship and a consummate work of art. Each STEINWAY piano, consisting of more than 12,000 individual parts, has its own musical character and is as unique as the individual who plays it. 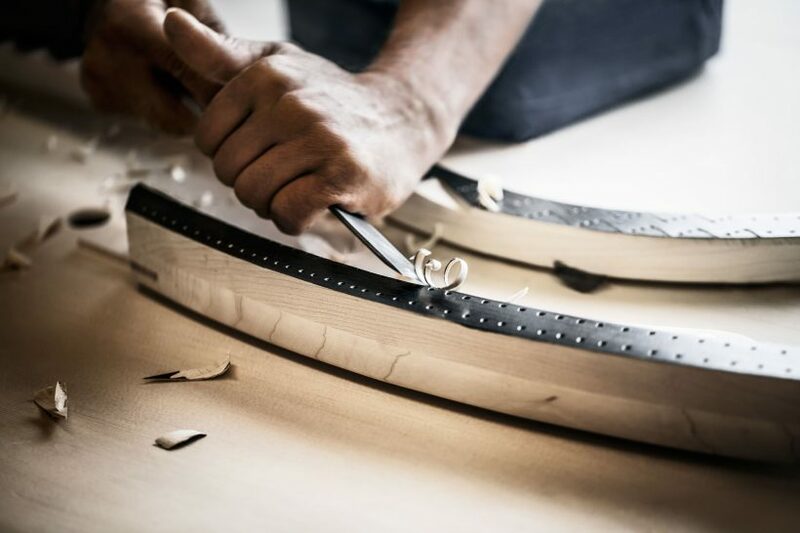 The one-piece continuous bent rim, 31/4″ thick, is one of the most significant technical innovations in piano building. The rim provides the foundatin for the beauty, stability, and quality of each STEINWAY grand piano. 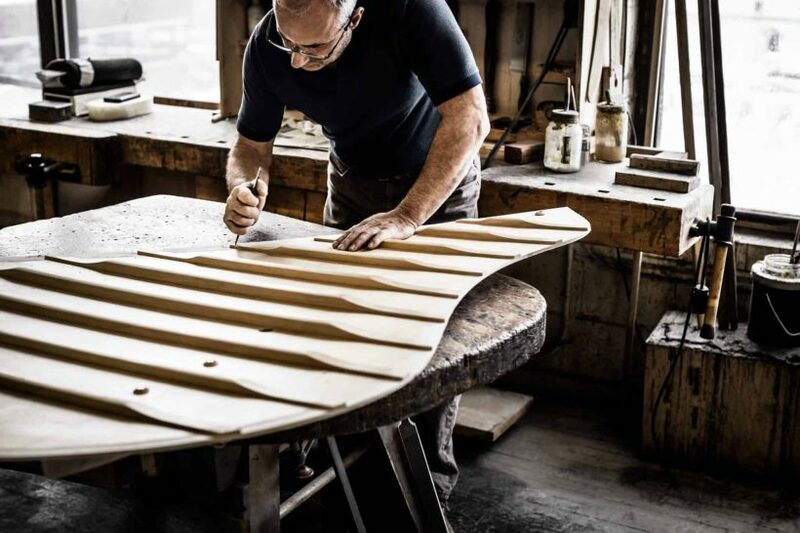 The rim of the STEINWAY Model D is comprised of 17 layers of hard rock maple – with both inner and outer rim being pressed together in a single operation – which provides the structural integrity that enables a STEINWAY piano to endure for generations. This unique rim construction has been an integral part of every STEINWAY grand piano since it was developed and patented by STEINWAY & SONS in 1878. Created like the soundboard of violins to give a free and even response throughout the entire scale, the soundboard is 9mm thick in the center and tapers to 6mm as it apporches the rim and outer case before being double crowned. The design permits complete freedom of movement while displacing a greater amount of air, creating a richer and more lasting tonal response. Close-grained, quarter-sawn sitka spruce – which has unusual stability and vibrance under stress and vibration – is used exclusively for the soundboard. The better the materials, the better the sound. 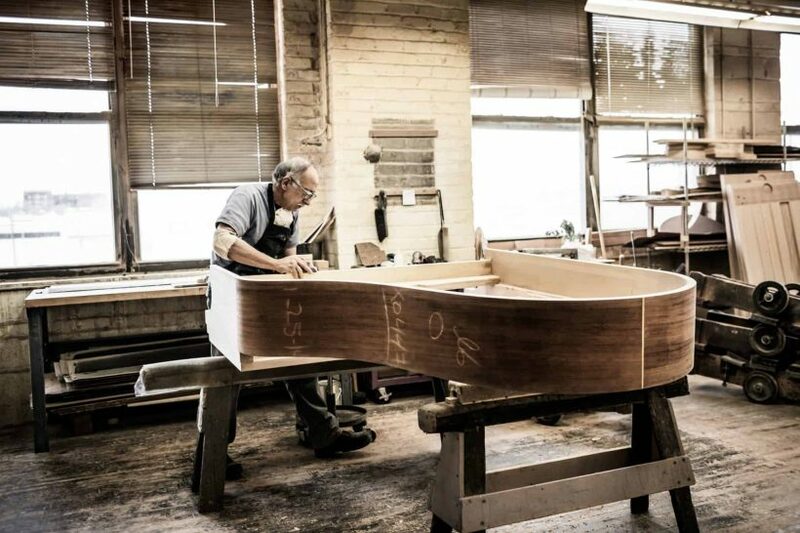 STEINWAY & SONS constructs its soundboard bridges exclusively from vertically laminated hardwood with a horizontal grain, capped with solid maple. Each bridge is notched by hand for precise, individual string-bearing. This design ensures optimal sound transmission from the strings to the soundboard, resulting in a sustained, resonant tone – creating the inimitable STEINWAY SOUND. In 1963, Steinway introduced the Hexagrip Pinblock, which is engineered to enable pianos to hold their tuning longer and with incredible precision. The Hexagrip patented design features 7 laminations of quartered hardrock maple stock. Grain is symmetrically distributed at successive angles of 45 degrees and 90 degrees, employing uniform grain direction around the circumference of the tuning pin to provide the ultimate pin grippage. The exclusive design provides the tuning pin with smoother movement under torque, a more uniform retaining action, and a piano that holds its tuning longer. Treble bridges are hard rock maple vertical lamination capped with solid hard rock maple; they are planed, graphite coated, drilled and notched by hand for precise individual string bearing, with a design that defies splitting. Bass bridges are continuous with treble and maple doweled.